What's the difference between a Swedish pancake and a crepe? Not much, in my kitchen. Some quick online research yielded a comment that they are pancakes that "come in different languages". Hmmmmm, funny but not definitive. Both items are flat-not-puffy ultra thin pancakes, frequently rolled or folded around a filling. I typically make Swedish pancakes for breakfast or dessert with a sweet filling or sauce. 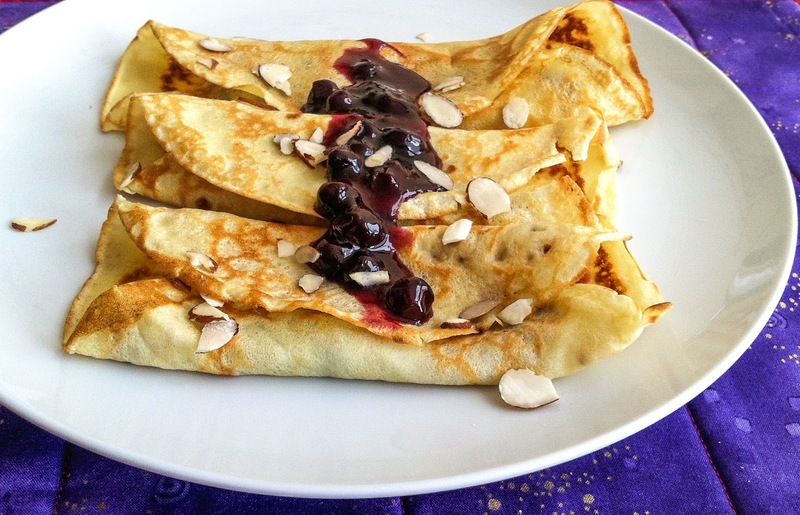 Crepes have been a bit more versatile as tasty wrappers for either savory or sweet fillings. Not much of a difference, other than the addition or omission of sugar in the batter. No matter, we enjoy them both no matter what the label. RL has a serious sweet tooth and relishes the sauce or filling more than the thin pancakes. 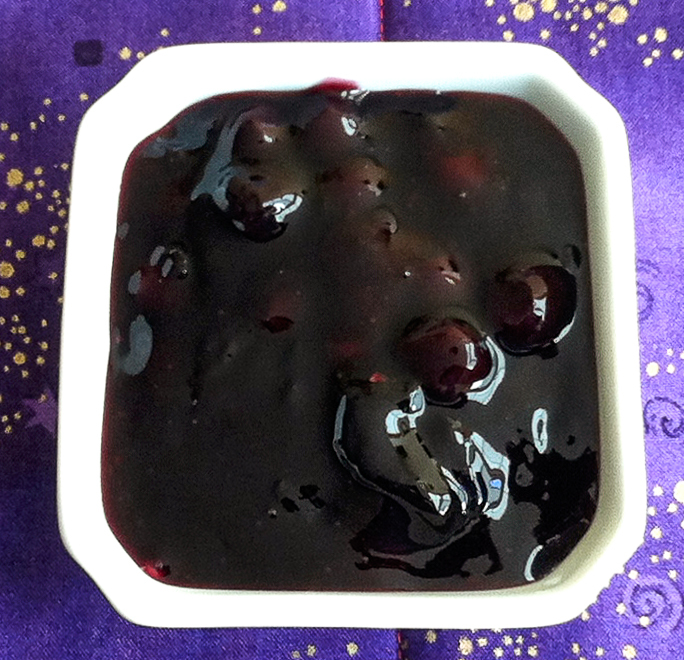 He loves this tasty homemade blueberry sauce as a topping for pancakes, waffles, crepes, ice cream or just straight off the spoon. While huckleberries and lingonberries are flavorful alternatives, those berries aren't readily available even in season, so blueberries are my berry of choice. Seattle groceries stock 3-pound packages of frozen blueberries year around, so the home freezer always holds bags of berries when local berries are out of season. During late-summer cruising in SE Alaska we head for berry patches accessible from dinghy or kayak, or stay on high alert to avoid sharing the site with hungry bears. Grate a small lemon and set the zest aside. Juice the lemon (you will have extra), straining out the seeds. Combine sugar, cinnamon and cornstarch in a medium saucepan. Add the berries and stir to mix. Add the water and lemon juice and cook over medium heat until thickened, stirring occasionally. Avoid a hard boil or it may bubble up over the edge of the pan. Keep the sauce warm until ready to use, or reheat gently. Again, keep an eye on it so it doesn't boil over. Add the lemon zest, if using, just before serving. Use a medium bowl and combine eggs, milk, flour, sugar and salt. Beat by hand (or use a blender or mixer) until smooth and lump free. Add the melted butter and whisk or blend to incorporate. Heat a skillet (cast iron or non-stick) over medium-high heat. Use a ladle and pour 1/4-cup (2 oz) batter into the middle of the pan while tilting the pan to swirl the batter so it spreads out to coat the bottom (similar to making crepes). Cook until bubbles form and the bottom surface browns. Flip and cook to brown slightly on the second side. Add a line of blueberry syrup down the middle, plus any optional fillings, and keep warm in a very low heat oven Repeat with the remaining batter. Serve 2 or 3 pancakes per plate on warmed plates and offer additional warmed Blueberry Syrup, jam or powdered sugar.